Please note that NO requests to change vest sizes, vest colour or race categories will be entertained. 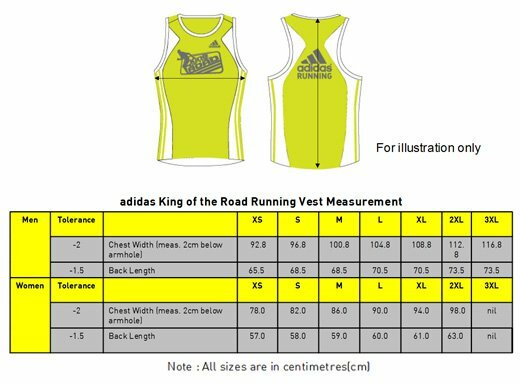 It is compulsory to wear the adidas KOTR running vest at the event. Any runner failing to comply with this rule will be disqualified from the event. The runner will not be entitled to any Finisher’s medal, certificate or any prizes. The "Gun Time" will be used to determine the winners for each race ( 16.8 km & 10 km ). Each participant is allowed to win only one prize-money award. A winning participant in more than one category may elect to receive his/her award in the category offering higher prize-money. Regardless of the winning participant’s choice of prize-money, his/her finishing positions in each of the relevant categories will not change. For prize winners or possible prize winners, disputes and appeals must be made immediately within 30 minutes of the published results on the results notice board on-site or immediately after the prize presentation, whichever is earlier, failing which the Organiser reserves the right not to entertain any disputes or appeals thereafter. For all other participants, disputes and appeals regarding the results must be submitted in writing including electronic mail within 7 days of the Race Day. The Organiser reserves the right not to entertain any dispute or appeal after 9th October 2011. The Timing Tag is a single-use, disposable device. Participants can and are asked to deposit the Timing Tag in the Recycle Bin at the finish area after their race. All Participants who successfully complete the race ( 16.8 km & 10 km ) will be awarded a Finisher’s medal upon presentation of their Bib Number to the respective officials at the medal collection counter. All Finisher's Medals must be collected on Race Day. No requests thereafter will be entertained. A Baggage Handling Service will be made available to all participants. Please ensure that your belongings are kept in the KOTR Tote Bag provided with your Race Entry Pack. Loose items will not be accepted. Runners are encouraged to pack light on Event Day. Please don’t bring valuables to the event. The estimated waiting time for collection of deposited baggage from 8:30am to 10:00am may be up to 45 minutes. Runners are encouraged to pass their belongings to their friends, family or trusted supporters before the race to avoid the post-race wait at the Baggage Tent.